So as you may know the 2016 trend so far seems to be colour correcting, green concealers are everywhere, orange concealers, lilac, basically coloured concealers are all over the place right now and seem to be being used by everyone, from Youtubers to bloggers to celebrities. 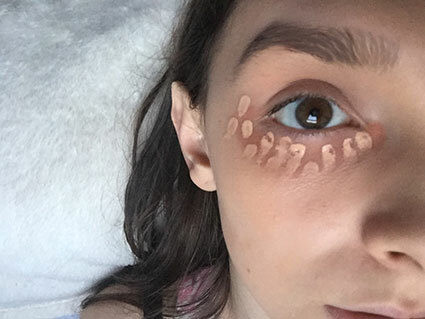 I have a little hack for anyone who hasn't yet had the chance to pick up some coloured concealers or is running low on their's, especially for those under eye dark circles. 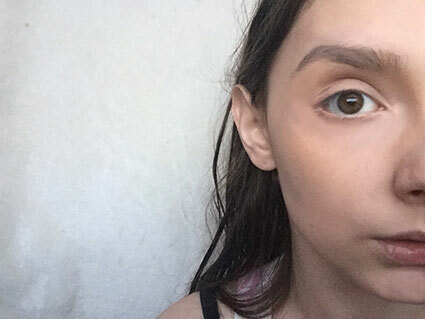 So for people like myself who have quite blue under-eye circles I would use orange, if you have more purple under eye circles you would use yellow. Now mine change depending on my sleeping pattern, if I have had a good sleep and I am not stressing or anything my circles tend to be more purple and less noticeable, but since my sleeping pattern has been a little abnormal lately they are more on the blue side. As you can see, my skin is a lot more blue towards my nose and then it sweeps out becoming more of a purple tone. When my circles are like this I tend to apply orange, but just how exactly do I do it when I have have ran out of my colour correcting concealer?! Well I use eyeshadow, yes eyeshadow, simple. but very effective. To begin I of course put on my primer and foundation over prepped, moisturised skin. (Also please ignore my damp hair, I was just out a shower). 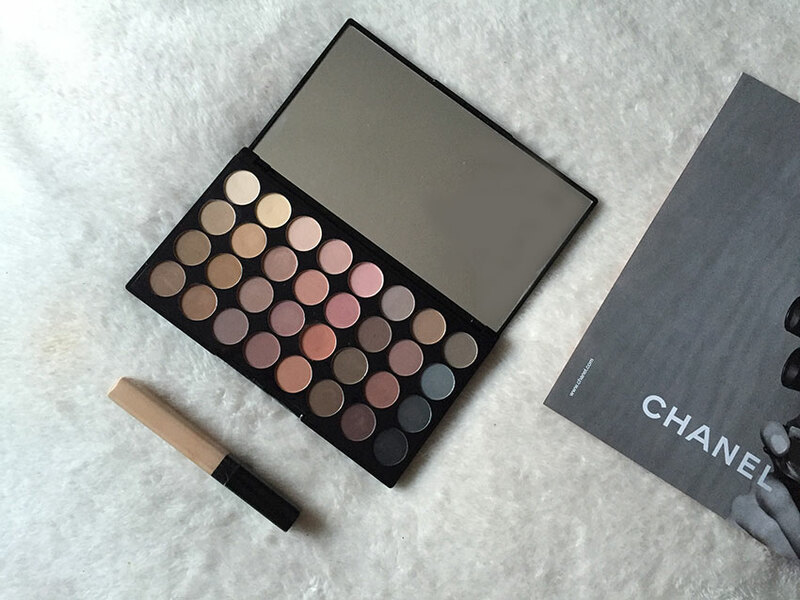 After I have applied my foundation I start of by taking a eyeshadow brush to my palette, for this tutorial I am using Makeup Revolution's Flawless Matte palette. I use the most orange shade from the palette and apply it to my under eye area. As you can see in the photo I apply from the corner of my eye around and to my outer corner, the reason I do this is because I have a little discolouration on my outer corner and this of course helps. I apply it down to a point ending where my dark circles end on my cheek. On top of this I apply my new favourite concealer the Maybelline Fit Me Concealer. I apply the concealer in dots around my eyes, I do two rows of dots one directly under and around my eye and then one slightly overlapping it. I apply my concealer in dots and not a triangle like most tutorials show you because it works better for me. The triangle does works just as well as the dotting does, but it makes my make up feel a little packed on personally, I think it's a preference thing really. 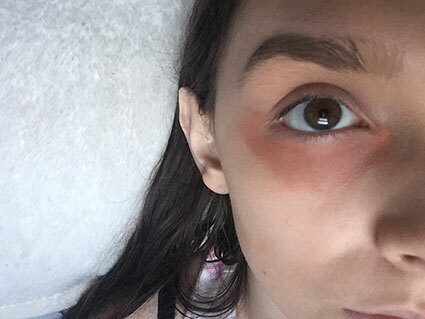 As you can see it kind of looks rather odd, but if you cover it all properly it can look very clear and your skin will look amazing with no dark circles. I take my beauty blender and I blend in the concealer and orange eyeshadow until my under eye area is completely covered and I have no visible dark circles. As you can see my under eye circles are gone, but if I hadn't used the eyeshadow trick my dark circles would still be partly visible even with my concealer on over the top to hide them. Of course if your dark circles are of a different shade or colour you would use another coloured eyeshadow to neutralise the colour and if you have colour correcting concealer you would use that instead of course, but this is a little trick for when you don't have any colour correcting concealer to use. 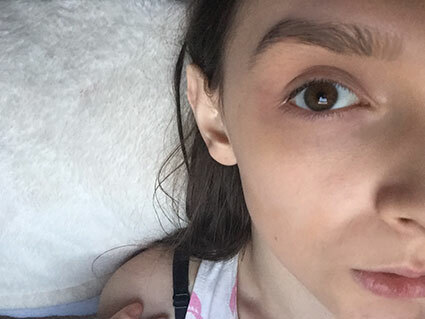 Also hate having to mention this, but my brows are not filled in which is why they are very fair towards my nose, I don't know why my brows are like this. Do you use colour correcting products? Which ones do you recommend?